Each day through the end 2017 LA Film Festival, Film Independent blog correspondent Cortney Matz will be recording her experiences and offering an insider’s perspective on how to enjoy this year’s festivities. We all love to laugh, right? Well, I sure do. And what’s impressed me about so many of the films at this year’s LA Film Festival is (of course) their balance of poignancy and authentic storytelling—but also that they’re also just so darn funny. Take Friday night’s offerings, kicking off in Culver City with a film literally titled, Humor Me—you know, the film based on the website that became a play that became a book/lecture series—and ending with Lea Thompson’s directorial offering The Year of Spectacular Men in Santa Monica. The irony of Spectacular is that none of the men featured in it are particularly spectacular, as audience members in the post-screening Q&A pointed out. The sarcasm implicated in the title flows freely throughout the film, a family project written by, starring and scored by Thompson’s eldest daughter, Madelyn Deutch (Deutch’s real-life sister Zoey is in the film as well, playing Maddie’s character’s sister). For sure, we have our darker moments as well: late-night presentations And Then I Go and Replace taking us to some angst-filled and horrific places. But the post-screening Q&As still draw laughs, as filmmakers recall the production and development of their gripping narratives. Catching the funny females behind IFC’s new Baroness Von Sketch Show at the Kirk Douglas Theatre means missing the G-Funk screening at the Theater at the Ace Hotel downtown (including a live performance by Warren G) but I’m okay with that. Having never heard of the Canadian sketch show featuring women in their 40s grappling with normal life weirdness in completely charming though necessarily over-the-top ways, I was delighted to be introduced. 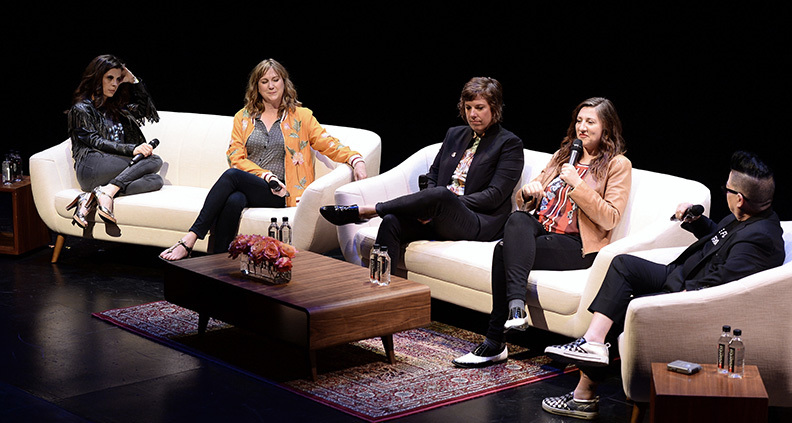 Moderated by an enthusiastic Lea DeLaria (Orange is the New Black) the panel of executive producers, writers and stars of Baroness take turns complimenting one another and giving insight into the impetus and fuel for their buzzworthy show. Meredith MacNeil, Jennifer Whalen, Carolyn Taylor and Aurora Browne clearly love working together. The joy and satisfaction of creating something together with like mind and being allowed to write in one’s own voice are hailed and echoed, which is in stark contrast to the familiar due-paying process of writing for someone else’s show and acquiescing to the shots called by someone else. What MacNeil, Whalen, Taylor and Browne are really championing is the freedom to create, even within the necessary boundaries of a TV schedule and the full buy-in of a supportive creative team—one that includes some pretty stellar hair and makeup (best enjoyed in the “Dry Shampoo” sketch which the audience was treated to, one of several sprinkled throughout the panel). With no real history of working together in quite this capacity, the sketch vets joined forces only recently (three to four years ago) to craft a pitch that they believed had to be picked up by the network. So—I have to tell you a little bit about this “Dry Shampoo” sketch, because it’s so fun. It features a woman who is perpetually arriving late to a cafe gathering, each time with a story about how awful her day has been and how she doesn’t have a minute to herself. Her friends listen sympathetically, but can’t resist pointing out how amazing her hair looks (and it looks truly spectacular—no sarcasm here). Of course, the beset woman explains that the secret is dry shampoo. The ritual escalates, and it becomes clear that the woman has not showered in months and is drawing flies—but gosh darn it her hair looks great! And really, isn’t that all that matters? Thus with tongues firmly in cheek, we applaud the independent spirit of four women creating work for themselves that is fulfilling and meaningful. In Spectacular, we applaud the independent spirit of a filmmaking family working together. We applaud the grit and determination it takes to have a dream, make the dream, and share that dream with ever-increasing numbers of people.